SK Setiam pupils in good hands. BINTULU: Flooding at Kuala Tatau yesterday forced 198 people from 73 families to be evacuated from their longhouses. The evacuees were from Rumah Ningkan Bungkong Sg Setiam, Rumah Nelson Gima and Rumah Baledan Anum. 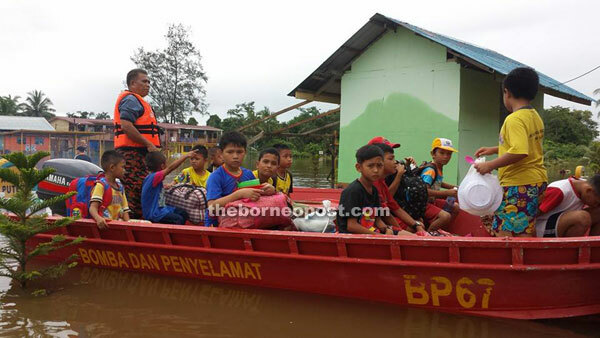 Bintulu Fire and Rescue Department station chief, Dihata Gobel, when contacted, said about 54 pupils from SK Setiam were ferried to their respective families after water level rose to about three feet. Meanwhile, at press time, Dihata said the main road heading towards Ulu Sebauh was impassable to small vehicle. Meanwhile, eight people suffered minor injuries after their cars skidded and plunged into a steep cliff of a collapsed road along KM17 Tatau-Bintulu Road around 11pm on Sunday.